Lot of questions were asked about the receiving possibilities of the signals sent by MASAT-1 satellite since it was put into orbit. We always answered that this is a simple task; you only need to have a suitable radio receiver and antenna and also a PC, on which the Masat-1 receiving software is running. The „only” problem is that the suitable amateur radio receivers are not cheap for a normal user (we can say that the price of an amateur radio receiver capable of receiving Masat-1 is similar than that of a notebook). On the 1st birthday event (1 year anniversary of Masat-1 in space) we have announced that a low-cost, USB capable Masat-1 receiver device is prepared. After several weeks of development and testing, the first version of the receiver is now ready for publication. We have also made some modifications in the public client software, to be able to handle this new receiver hardware. The RF signal coming from the antenna is amplified by a low-noise pre-amplifier. This amplified signal is then sent to the IC input of the FSK receiver, which is similar to the FSK IC in the satellite itself. The reference clock signal of the FSK receiver is provided by a thermally compensated quartz oscillator (to ensure suitable frequency stability). The FSK receiver IC and the thermally compensated quartz oscillator in this receiver device is provided by Silicon Laboratories Hungary Kft., for which we would like to express our many thanks! The received bit sequences coming from the FSK IC are arriving to the microcontroller in digital format. The microcontroller is interfacing with the PC by a serial port-USB converter. The receiving bandwidth is approximately 2 kHz, however the Doppler-crawl is about +/- 15 kHz due to the orbit and the velocity of the satellite to the ground station. The receiver software continuously calculates the actual receiving frequency of the receiver device according to the actual Kepler data (TLE) – therefore the tuning of the Masat radio receiver is automatic. Besides, the receiver software generates a data file as well according to the current geological place of the receiving station, including the azimuth and elevation angles (it tells where the antenna should be facing during the satellite passing) and the Doppler-crawl value (how should we tune the radio if it was not automatic). This feature is especially useful for secondary school students, to demonstrate Doppler-shift and the orbits when they are learning wave science, astronomy and space mechanics. 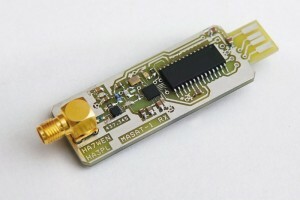 The sensitivity of the Masat-1 receiver device is better than a radio amateur appliance -capable of receiving the satellite- because it was designed especially for the Masat satellite(s). We also would like to emphasize that this receiver device is capable not only to receive the signals of Masat-1 but will be able to receive the further Masats after a software update. Regarding the antenna -because it is also necessary for receiving our satellite – the very good sensitivity gives the opportunity to use a very simple antenna made of a steel measuring tape. Our aim was to provide a very simple and easy-to-make antenna which is very cheap, as it is available in every DIY store by few euros. Every user is able to make his own antenna out of it using scissors (the sizes and the build-up will be provided with the receiver device).